One of my all-time favorite restaurants in Portland, the departed Vat & Tonsure, used to serve this appetizer. This is my recipe that has evolved out of memory and guesswork. The artichokes are good served warm or chilled. Fill a medium-large pot (large enough to just hold the artichokes) over halfway with water. Squeeze the juice of one lemon into the water (reserving the squeezed lemon halves), then add a generous pinch of salt, the herbes de Provence, peppercorns and the bay leaf; bring to a boil. Meanwhile, prepare the artichokes by first pulling off their tough outer leaves, cutting off the pokey tips of the leaves with either a knife or scissors, trimming the stems, and rubbing the cut surfaces of the artichoke with the squeezed lemon halves. Once the artichokes are prepared, add them to the water, stem-side down. Cook, partially covered, at a gentle boil for 35 to 45 minutes. The artichokes are done when a leaf can be easily pulled off and when the bottom is tender enough to be pierced with a paring knife. 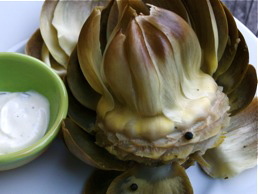 Remove artichokes from the water and drain, upside down, in a colander. If you are serving them warm, let them drain a few minutes first; otherwise, drain, then chill. While the artichokes are cooking (or chilling), make the caper mayo. Squeeze the juice of the remaining lemon into the mayonnaise; whisk until smooth. Add garlic and capers and stir until blended; season to taste with salt and pepper. To eat: Remove leaves one at a time from the artichokes and, as you do so, dip the bottom of each leaf into the caper mayo and scrape with your teeth the meaty part of the leaf. Once you get to the middle part of the artichoke, remove the purple leaves and choke (the fuzzy center) with a paring knife, to reveal the heart. The heart, once trimmed of the choke and any fibrous strings of the stem, is the best part.